Using olive oil for baking is a familiar feature of Mediterranean cooking. While it may sound a bit odd, baking with olive oil has actually been done for centuries. Baking with olive oil instead of butter gives cakes and cookies a light texture and can be used with confidence in lieu of butter or other oils. 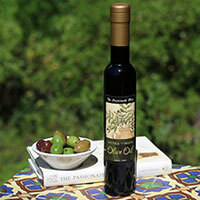 It best to use a lower intensity, late harvest extra-virgin olive oil when baking which gives a subtle flavor. The dominant taste of high intensity olive oils may interfere with the end result taste. To help you determine how to substitute olive oil in baking or other cooking recipes, use the chart to convert the quantity of butter called for in a recipe to the required quantity of olive oil. This conversion chart is more for baking recipes where quantities are critical. Just note, you cannot convert all recipes, for example cake frosting, where the item must stay solid at room temperature. Sign up to our newsletter and get our handy “Substitute Olive Oil for Butter” conversion chart download. brilliant! what a fabulous idea. can’t believe I never thought of this! Thank you for the equivalents as I love cooking, making all food for our tours. I’ve used olive oil in baking (boxed cake mix) when I’ve run out of canola oil, using a little less and the results were great. Thanks for the conversion chart! If your brownies tasted like olive oil, you used an intensive, early harvest olive oil. Perhaps you used a Tuscan varietal olive oil. You must use low intensity or late harvest EVOO to get the best results. What olive oil I’d best to use? Do I want a really light color? Use a low intensity or late harvest EVOO. These olive oils tend to be light in color. I found a great Chocolate Dulce de Leche recipe from Argentina. It calls for 1 cup of neutral oil. Can I substitue olive oil? And if so how much? 1 cup of oil is 1 cup of extra virgin olive oil also. The word “neutral” means without intensity, so make sure you use a late harvest or delicate/mild olive oil. Don’t use Italian varietals or Tuscan blends, they will be too intense. Would you mind posting the recipe. Sounds great! Let us know how it turns out. I recently baked scones with EVOO because I had nothing else on hand. The taste and texture was great! How do I use olive oil in place of rendered butter? I used olive oil in brownie mixes, for Chritmas last year & they didn’t cook in the middle! They were crispy on top and dough in the middle, you had to eat them with a spoon! I used the amount of oil on the box, what happened? Also, do I add extra flour to cookies to make up for the extra liquid? Don’t know what happened; perhaps contact the brownie mix company. Since you were just substituting olive oil for the vegetable oil amount on the box, there should not have been any issues. I have a table in my book (page 202) and on my website for converting butter amounts to olive oil.